kitschy: I love that word... I had to look it up so see what the heck it meant! March 25, 2009 | Patty L.
Until she passed away when I was five, my grandmother made me a doll cake for every birthday. I really wish I had a photo. 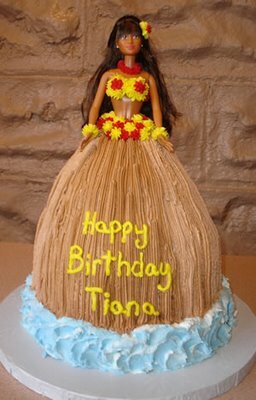 Has anyone else noticed that the Hawaiian Barbie cake doll has frosting in her hair? I wonder how they'll get THAT out - you wouldn't really want to lick it off now, would you? My aunt has made both the crocheted versions and the cake version. Hers are/were actually sort of cool compared to these. OMG! For my 21st birthday my dorm mates made two of those cakes one girl one boy. the girl was upside down wearig a pipe cleaner thong and the guy was upside down naked! man that was a good bday. AHHH! JANE! The same thing happened to me! except only one cake two naked dolls male and female the cake only came up to the knees. GREAT DAY! My mom was our local amateur community cake-maker, and she had the Wilton doll cake set (the mini one with 4 cakes and 4 dolls, not the bigger single one). It was much less trashy to use the kit, since the skirt shape didn't turn out looking like a TP cover. Plus the dolls were attached to picks so they didn't start leaning like 1/2 a barbie does. I'm TOTALLY NOT a professional cake maker, but a couple of years ago some friends and I used those pans to make a 2-tiered, 4-breasted cake for Annie Sprinkle and Beth Stevens' yellow wedding. Topped with 4 very perky yellow breasts. seriously, pretty much ALL of my birthday cakes were like those hehe. i like them... they're kinda weird, yah, but they bring back happy memories for my. 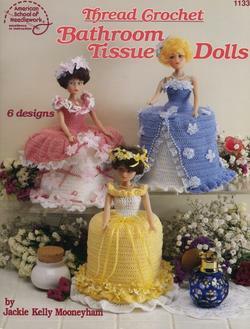 fyi, mine weren't as awkward as the picture ones, and i never had a ken cake. although now i sorta wish i had!! 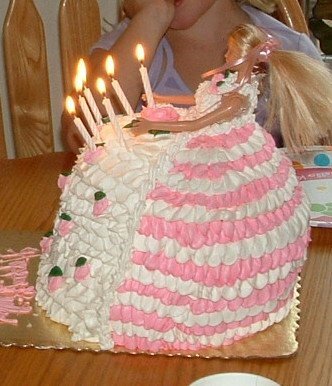 I had a barbie cake when I was three. The only problem was, I wanted a Hotwheels cake. Yes, I'm a girl. My younger sister had one of those cakes for about three birthdays. By the time my birthday came out, Mum chucked out the giant mountain dress and just assembled a Barbie on top of a flat cake. That was a pretty rocking cake. Usually I manage to stop myself laughing out loud at the cake wrecks... this is a valuable skill learned back in the days of ICT teaching when it's a REALLY bad idea to laugh when a teen boy is telling you his 3" floppy caught a virus... but the Ken in a skirt with a c**k ring? That is still making me laugh, and I'm not even LOOKING! I need kids, so I can make them a doll cake. Ironically, my 4 year old has been begging for a dolly cake for her next birthday. 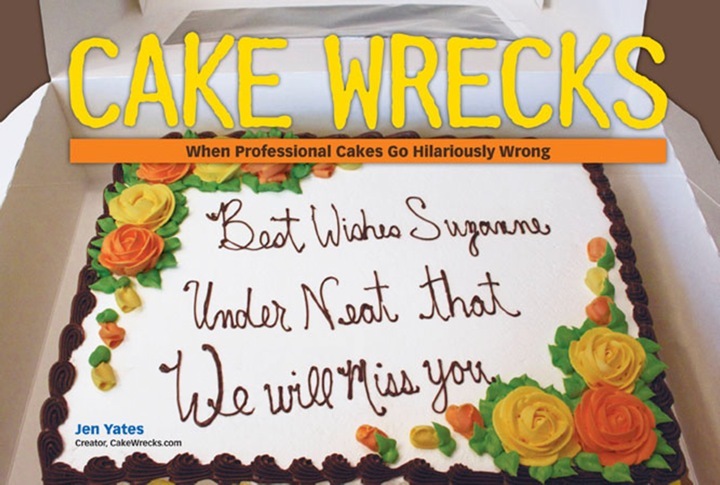 Those cakes are tragic poor children!!! I know the bakery that makes those "Ken doll drag cakes" (unsurprisingly, it's in San Francisco) as they have them out on display on a picture window, along with cakes that would have to be censored here! No, I don't know anyone who actually ordered one! I tried to make one of these for my little sister once. I believe I was 14 and thought that the round dress could be made with a bundt cake pan. I borrowed one of lil sis's barbies and let's just say that the barbie was taller then the cake so the dress looked like it flounced of her thigh area, definitely nowhere near her waist. I wanted to throw it away right then but our mom made me serve it to lil sis in front of the whole family. She's now the age I was when I made it and still likes to remind me of it just to see me squirm. "My lap! My lap! My lap is on FI-YUR!" NEVER fails to crack me up. I've been to this one page a gazillion times and I ALWAYS laugh at that one. Hahahahahahahaha - I love Wilton, especially with their doll picks used in conjunction with their Wonder Molds!!! I like how the easy chair barbie has a highlighter marker neon pink rose plunked down on her lap like that is going to compensate for a disaster done in sugar! 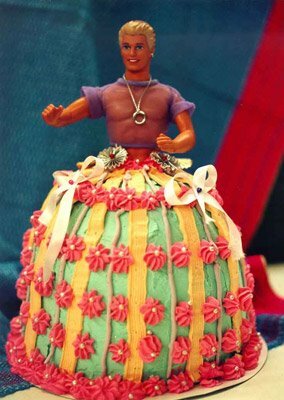 And now I feel this strange urge to make a drag queen ken cake! How awesome would a drag-queen Ken cake be? Eleventy-nine awesomes, that's how awesome. The "Climb Every Mountain" cake is hilarious! I have to admit that I made a princess cake like this (but much better!) for my daughter's birthday. She saw one at the grocery store bakery and had to have it for her princess party. Can you believe the grocery store bakery sells them for $60 and it's not even a real doll inside. Looking at these made me remember the Barbie Doll cake I made my daughter. I wish I had a picture of it. 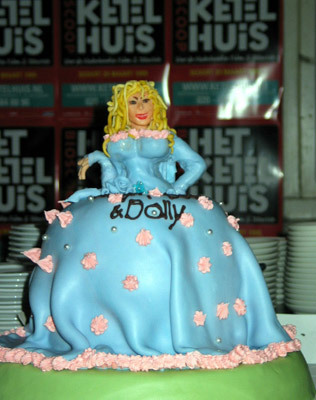 I wish I had a picture, but when I was a little girl, my mom ordered a "doll cake", supposedly like those above. Instead, the lady got us a cute (but weird) dog cake with head phones?? My older sister got a Barbie cake for her 1st birthday (she is now 22). We have this event on tape, so I have seen it many times. She wasn't allowed sugar until she turned one, so upon seeing the "dolly" she gave it a BIG hug... and ruined the cake. Gotta beware of those cakes pretending to be play things! 2nd grade, Mom made me a gorgeous doll cake. Candles around the bottom of the skirt part, she lights the candles and carries the cake to the table..by the time she gets there the dolls hair is on fire...burning like a torch! A house full of screaming 7 year olds. This is the same birthday that a girl came up at lunchtime and asked if my party was still on for after school..when I asked why she said her Mom called and wanted to know because our house was on fire earlier. HUH?!!! I called my Mom in tears...Dryer fire..damage only in part of the basement, yes the party is still on. And then... the same girl (who was a snobby thing)gave me "Toilet Water" as a gift...at 7 I had no idea and coud only assume it was water from the toilet. *gasp, wheeze* The 'lap is on fire' and the Ken cakes made me laugh so hard, tears sprang to my eyes and I started to hyperventelate. My friend Allie's doll cake's hair caught if fire and set the entire cake on fire. This reminded me. That Ken doll has been sold with the mesh shirt and co-umm, silver ring necklace included, though sans cake-y dress. It was in a cracked article XD I'd love that, if only to laugh at it. PS: Just found this site couple of days back, and I love it! Is it just me, or did someone else have 'Girls Just Want to Have Fun ' rolling through their head while looking at The Ken cake?????? Thanks Jen!! And Earring Magic Ken? That's how he came, mesh shirt, c*ck ring, and all. I don't know what the designers were thinking when they gave him that necklace, LOL! Loved the pictures! I make cakes for people and some of these just cracked me up. I cannot believe some of these that came from professional bakeries!!!!!! Thanks for the laughs!